Original Poster. ‘The picture that has everything!’ Caveat emptor. 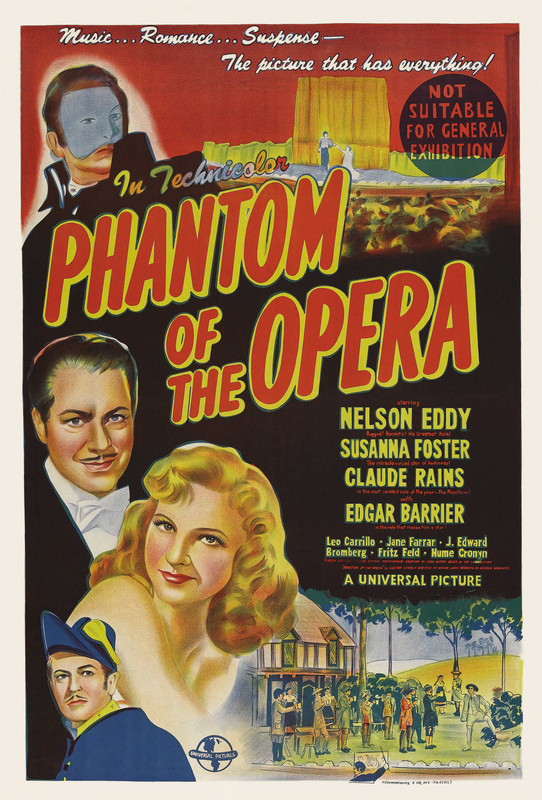 At the time, “Phantom of the Opera,” which cost approximately one million dollars to produce, was by far the most expensive picture Universal had ever made. What a shame it’s so terrible. They spent a fortune on costumes and sets, many of which look expensive, most of which are hideous. It’s big-budget vulgarity run amok. 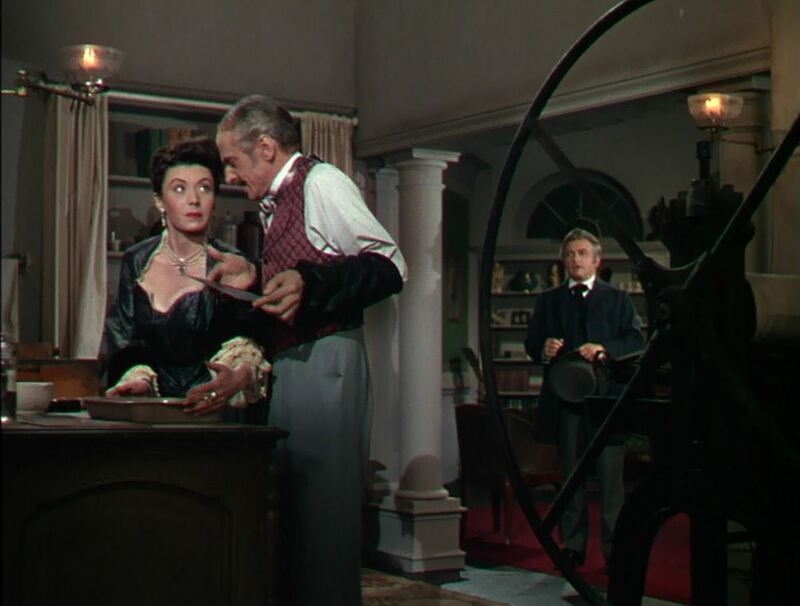 (The director, Arthur Lubin, went on to create “Mister Ed.”) With all the garish golds, sea foam greens, powder blues, pinks, lavenders and pale violets, it looks less like the Paris Opera than an Easter egg hunt. And with all the money Universal lavished on the production, I expect the studio bosses were loath to let well enough alone and allow the story to fit within the confines of the horror genre, so they added flaccid “comic” flourishes and strengthened — well, lengthened — the romance elements (which were more evident in the novel than in the Lon Chaney silent picture). 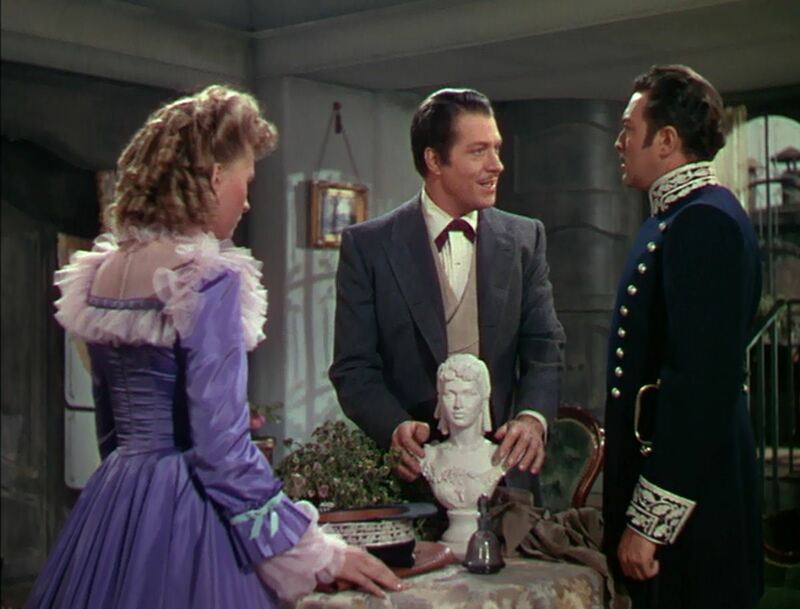 In this version, Christine (Susanna Foster) is wooed not only by Raoul (Edgar Barrier), who is now a police detective (rather than an aristocrat), but also by the opera company’s leading baritone, the barrel-chested Nelson Eddy, who is twice Foster’s age and looks older. 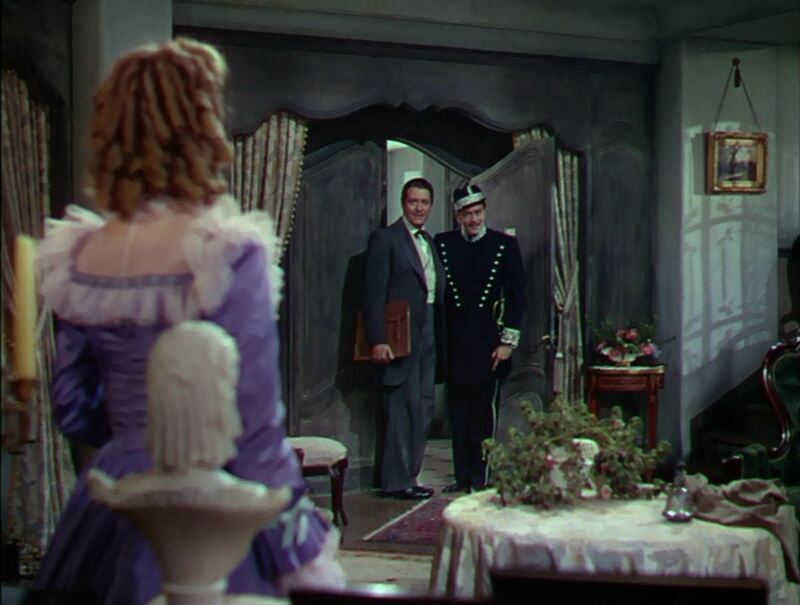 The two swains spar tiresomely — a running gag has them unable to pass through a doorway without bumping into each other — and our heroine eggs them on while primly denying them so much as a peck on the cheek. It’s extremely exasperating. ‘Comedy’ tonight. ‘After you, monsieur.’ ‘No, after you.’ ‘No, after you.’ ‘After you.’ ‘After you.’ et cetera . . . I thought they’d never leave. There is also an extended back-story to explain how the Phantom came to haunt the Palais Garnier. The script went through many drafts; the final result is a mess. 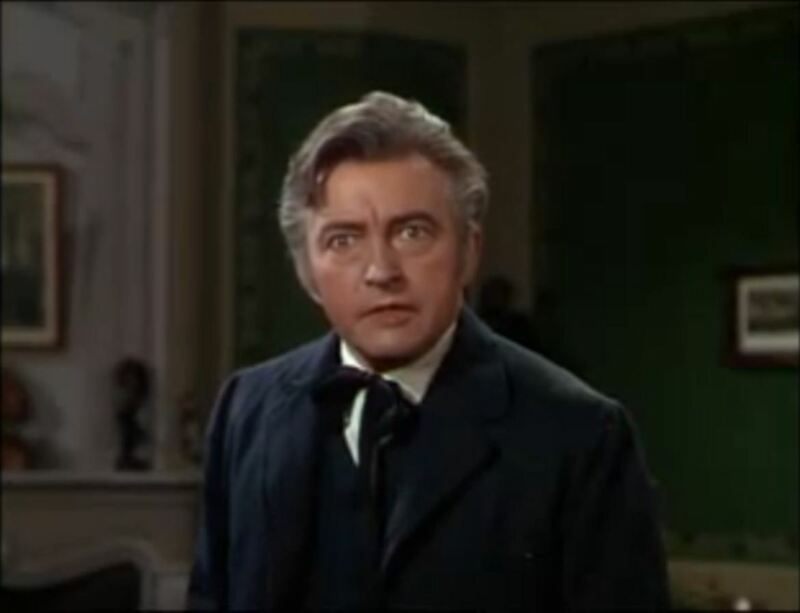 Claude Rains as Enrique Claudin: Painted like a whore. 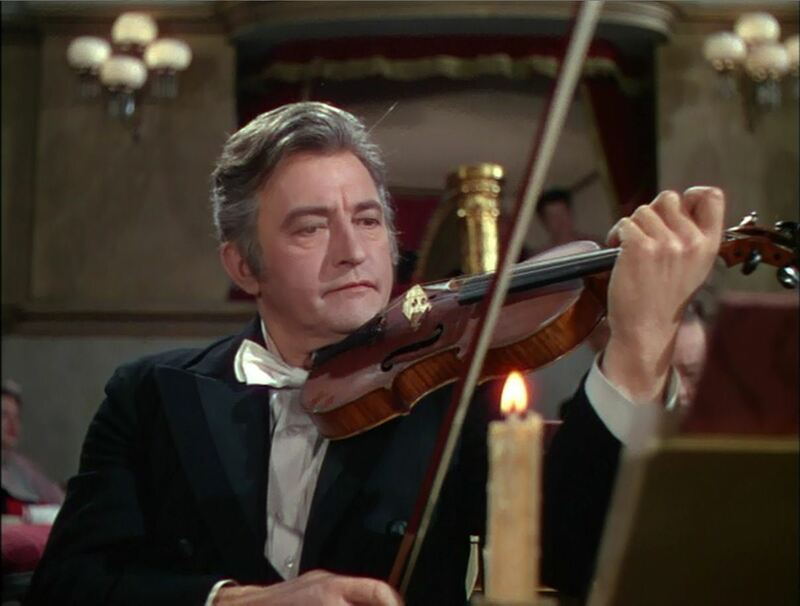 Considerable time and effort is expended on making Erique Claudin (Claude Rains) a sympathetic figure: in this version, he’s an aging violinist in the Paris Opera orchestra pit, who finds himself summarily discharged after twenty years’ faithful service because a recent injury to his left hand has made him unable to play in tune (!). (Oddly, this same injury will not prevent him, later in the picture, from clambering up ropes like a monkey.) We learn also that Claudin is behind in his rent and has not salted away so much as one sou — he has spent all his earnings paying for Christine’s voice lessons (anonymously, of course: the girl barely knows he’s alive). For several preliminary drafts, Claudin was revealed to be Christine’s long-lost father, but this invention was eventually scrapped and nothing was put in its place to explain his devotion to the young member of the opera chorus. We must presume, then, that he is either a randy old goat or that he believes the girl has a remarkable voice. Unhappily, the dialogue doesn’t support the former, nor Susanna Foster’s singing the latter. Rains took violin lessons to prepare for his role. And yet there’s hope for the wretched Claudin: he has composed a brilliant concerto (the solo instrument is not identified), which score he delivers to the great publishing house of Pleyel & Desjardins, certain that the publisher will rush it into print and save him from ruin. When he makes a follow-up visit, Pleyel (Miles Mander) is busy showing his mistress (Renee Carson) his etchings — both literally and figuratively. “Now, my dear, the acid,” says Pleyel to his mistress, Georgette, “Be careful or you’ll burn yourself horribly!” They look into each others’ eyes; saucily, he kisses her cheek. “M. Pleyel,” says Claudin . . .
Renee Carson, Miles Mander, Rains: Secret dalliance beside the pan of acid — an accident waiting to happen. Annoyed at having his diddling cut short by a meddlesome fiddler, Pleyel denies any knowledge of the manuscript, heaps abuse on him (“I’ve seen samples of your work before: perhaps some employee has thrown it into the waste-basket, where it belongs”) and orders him from his shop. 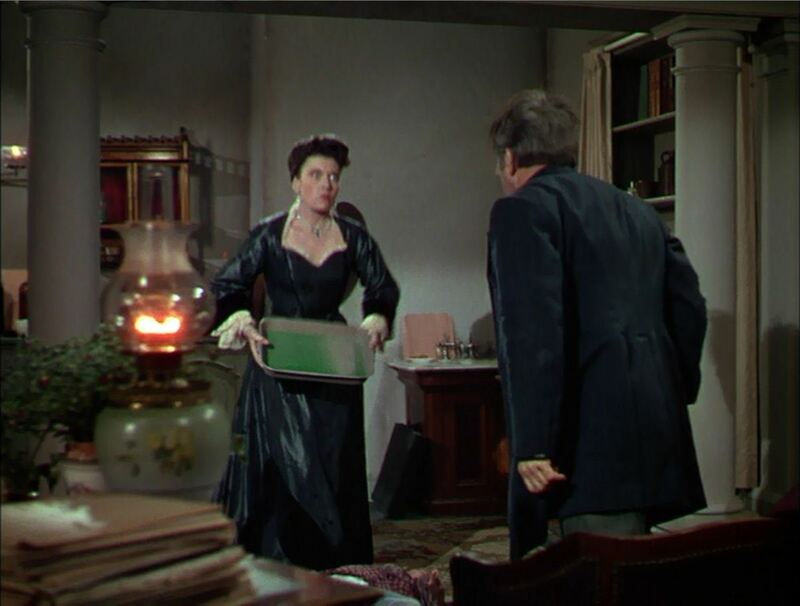 Claudin begins to leave, but stops short when he hears his music being played in the other room — an admirer is showing Claudin’s score to Franz Liszt (Fritz Leiber, in a George Washington wig). But Claudin mistakenly believes that Pleyel has stolen his composition. At this, his mind cracks. In a blind rage, he strangles the rascal publisher. 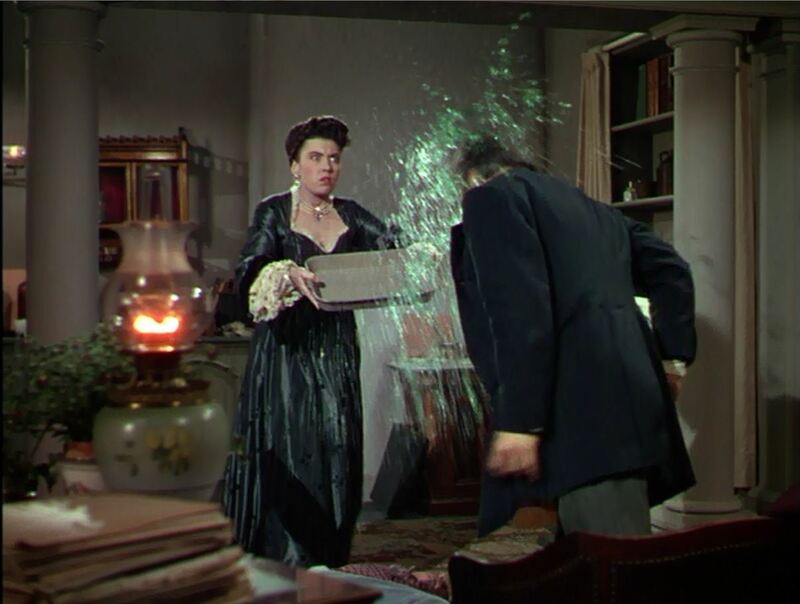 The terrified mistress seizes that pan of lime green etching acid and throws it full into Claudin’s face . . . and, handy-dandy, the Phantom is born. Carson, Rains: Prelude to an acid bath. Splish, splash! Miracle acid that burns the face, but not the hands or the bombazine. The Palais Garnier now must deal with a pot-bellied, aging violinist with an injured hand, an acid ravaged face, a silvery mask, a broad-brimmed hat, a flowing cloak, an ax to grind and an iron determination to hear Susanna Foster rend the air and set Paris agog with her middling voice . . . or else! Shortly after sustaining his injuries, Claudin swipes a ring of skeleton keys from the general manager’s office, and then proceeds to terrorize the opera company and its patrons for the rest of the picture. These skeleton keys give him magical access to every cranny, cubby-hole, cavern and subterranean lake in the place. In few, it’s a damned silly affair . . . and, alas, it’s not much fun. It sounds fun, but it isn’t. 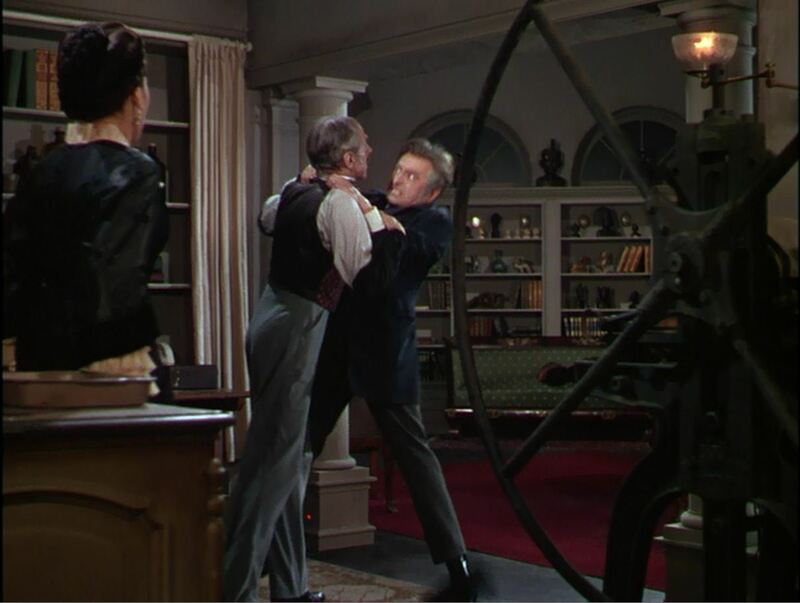 Claude Rains brings his formidable skill to his role and lifts the trashy material — but only slightly. It makes me heartsick to see him work so hard on such contemptible stuff. The writing is appalling. And how can anyone take him seriously when he is painted like the Whore of Babylon? The makeup was designed by the legendary makeup artist, Jack P. Pierce. God only knows why he painted the men to look like transvestites . . . Indeed, when at last Rains is unmasked, the prosthetic scars are scarcely more horrifying than the rouge, mascara and powder he wears early in the picture. Lucille Ball rarely wore so much lipstick. Rains and that damned chandelier. Lowering the lights — and the boom. 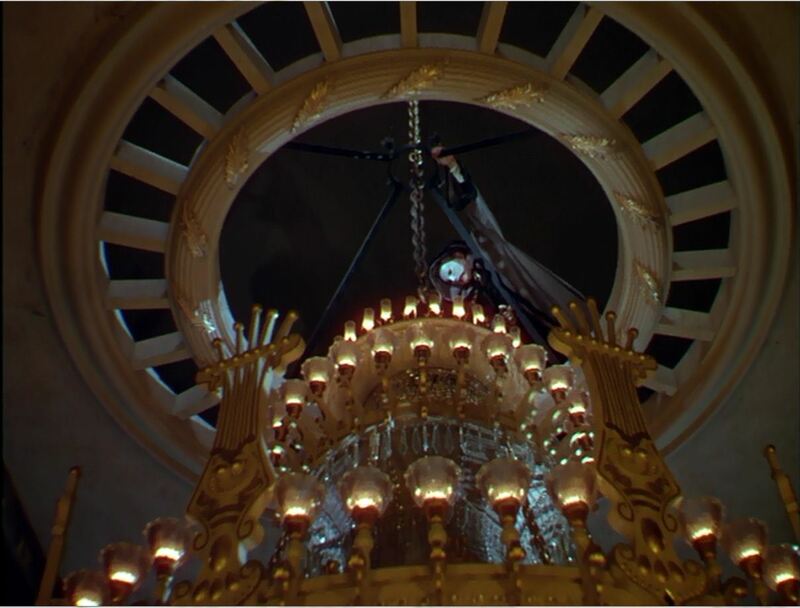 It was madness to attempt to film this story while the Second World War was still going on: the producers could not secure the rights to any of the operas associated with the famous book (e.g., “Faust”). The only genuine operatic score used in the picture was von Flotow’s “Marta” (about which, the less said the better); for the rest, themes from Tchaikovsky’s Fourth Symphony and from Chopin’s Polonaise in A major and his Waltz in C# minor were adapted and lyrics (in Russian and French) were added. The results are gruesome kitsch. In its first run, newspaper reviewers harshly criticized the picture for being “more musical than horrific.” I’d say they got this exactly backwards. The ersatz operatic numbers are excruciating without being funny. In small doses, however, the musical interludes may provide a few chuckles . . . but only a few. I recommend a few highballs prior to viewing. Finally, there is the unmasking. Jack Pierce put so much makeup on everyone throughout the picture, one may be forgiven for being disappointed by what he came up with for the climactic revelation of the Phantom’s acid-scarred face. He’s not entirely to blame. Rains was adamant about the makeup: he felt if he were given the full treatment, he would never again be allowed to play a leading man role. As it was, he only allowed one closeup. Arthur Lubin had a few hidden cameras placed at different angles to photograph him surreptitiously, but these shots are badly lighted and somewhat out of focus. That’s right — give away the ending. Rains unmasked by Foster. Much ado about very little . . . This entry was posted in Main and tagged Arthur Lubin, Claude Rains, Edgar Barrier, Faust, Fritz Leiber, Gian Carlo Menotti, Jack P. Pierce, Jeanette MacDonald, Lucille Ball, Marta, Miles Mander, Mister Ed, Nelson Eddy, Phantom of Opera, Renee Carson, Suzanna Foster, Tchaikovsky, von Flotow on April 11, 2013 by TR. Hello ! 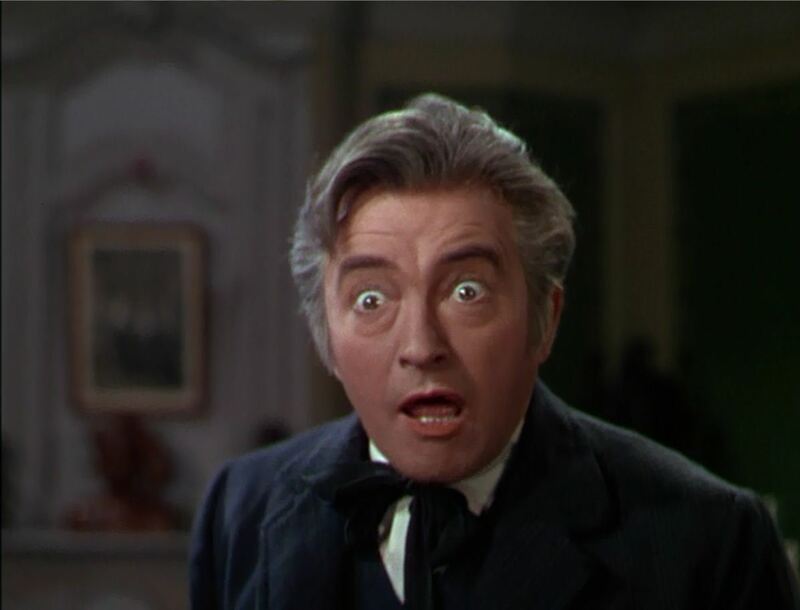 Really useful review 🙂 I’m writing a paper on the Phantom of the Opera and I would like to write about Claude Rains’s refusal of heavy makeup…but I can’t find a sources (except blog reviews). Do you happen to have one ? Where did you read about it ? 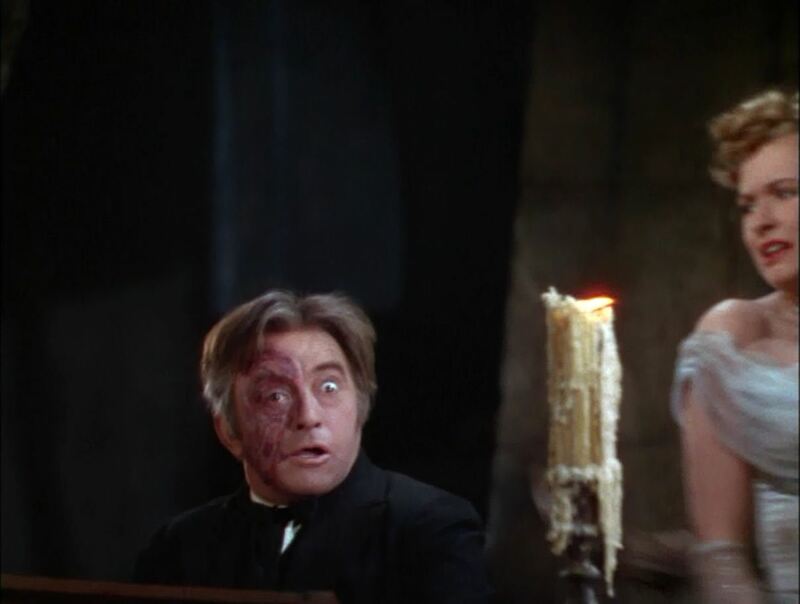 It pains me to know that Sir Andrew Lloyd Webber Has never given voice to the fact that Claude Rains was the first Phantom I am 89 years old and I remember seeing the film, and I remember it made a lasting impression on me. It is a pity that the first story line of the Phantom was not included in the later production. 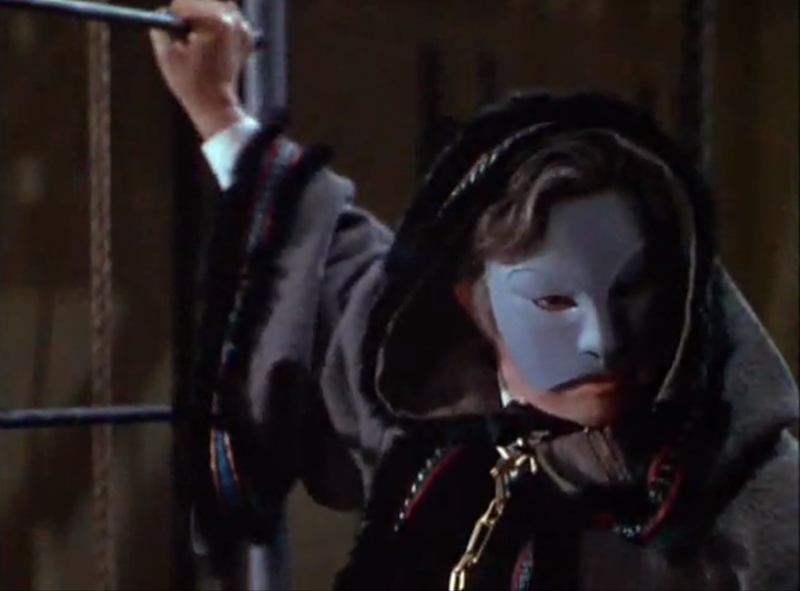 Of course I am not saying that Mr Crawford’s Phantom is nothing short of superb.